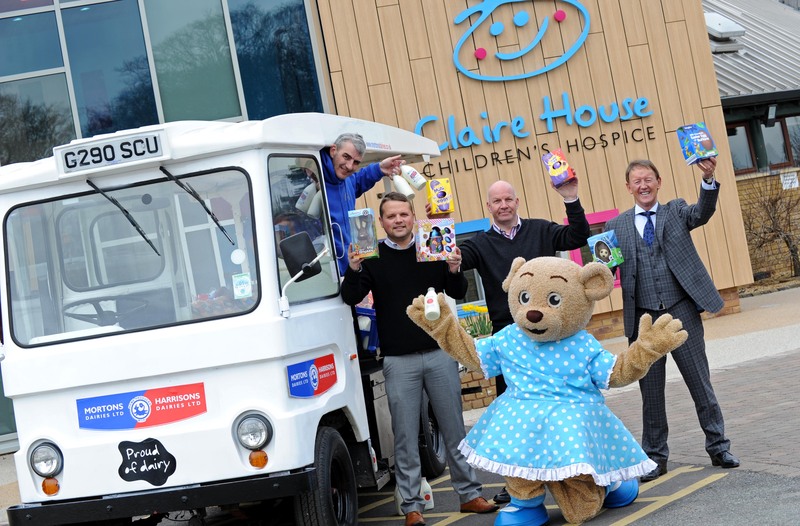 The family owned business, which has seven depots and 230 staff across the region, teamed up with customers served by their Wirral and Chester sites to donate Easter eggs to children and their families at the hospice. Mortons & Harrisons Dairies is a Merseyside based family-run dairy company which has been operating and delivering milk to the local communities since the 1920s. The company has grown significantly over the past 80 years to become the North West's largest dairy, with more than 55,000 customers and 230 staff. Image shows from Left to Right - Alan Mansell (Supervisor at Wirral Depot), Lewis Krater (Website Manager), Neil Potts (Area Operations Manager) & Steve Ledsham (Sales Director) and of course Claire Bear from Claire House Hospice.